Police in Singapore have arrested 14 people said to be part of a crime gang involved in global football match-fixing, including the alleged leader. Police did not confirm whether the alleged leader in custody was Singaporean businessman Dan Tan, but local reports pointed to him. 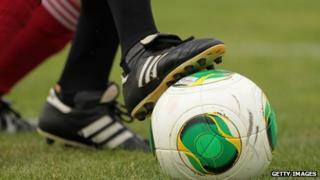 Between 2008 and 2011, officials said they had identified 680 suspicious games, 380 of them in Europe. Matches included World Cup qualifiers and the European Champions league. Police did not give the nationalities of the 12 men and two women arrested. They said that five - including the suspected leader - were being held for further questioning while the rest would be released on bail. "The arrested persons are being investigated for offences related to match-fixing activities under the Prevention of Corruption Act (Chapter 241) and for their involvement in organised crime activities," the statement said. Following the arrests, Interpol Secretary General Ronald K Noble said: "Singaporean authorities have taken an important step in cracking down on an international match-fixing syndicate by arresting the main suspects in the case, including the suspected mastermind." Fifa said in a statement: "We welcome all actions taken by law enforcement bodies to bring the perpetrators of match manipulation to justice." Dan Tan name's has been connected to fixing of football matches around the world for several years, reports the BBC's Jonah Fisher from Bangkok. In Italian court papers Tan Seet Eng, as he is formally known, is called the boss and it is claimed that from Singapore he ran a network of European fixers who paid players in the lower divisions of Italian football in return for influencing the result. Despite frequent calls for his arrest from both Italy and Interpol, the Singaporean authorities have to date refused to act. With no extradition treaty in place, they said they could only make arrests when a crime was committed on Singaporean territory.